What? 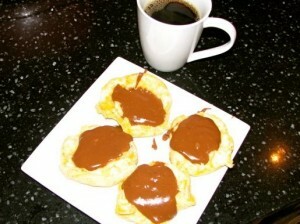 Chocolate gravy? Yep, that’s what I said. You heard me correctly. If you have never experienced chocolate gravy, you are seriously missing out! It’s like having dessert for breakfast. This recipe has been in my family for years and years. My great-grandmother used to make it for my grandfather as a child. Then, when he married my grandmother, he shared the recipe with her. It continued to be passed down from there. My mom has made it for us since I can remember. 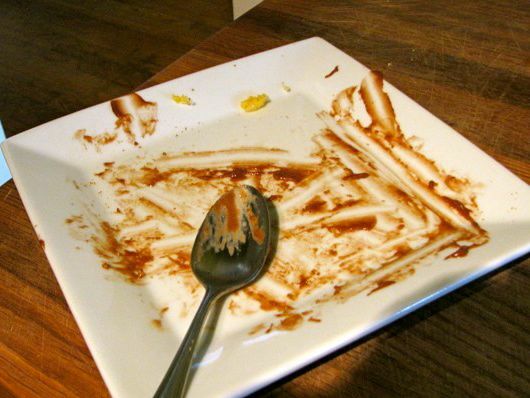 Every Christmas morning, we have chocolate gravy. To this day, my mom makes this for us whenever we are all together. My brothers, sister and I request it…and still fight over the biscuits. Just recently, I ventured out and started making it myself. I’ve only made it twice. Once on Christmas morning and then again today! Sort of a “special occasion” kind of breakfast. Haven’t quite nailed it quite as good as my mom, but hopefully I will get there! Buttery, chocolately goodness. 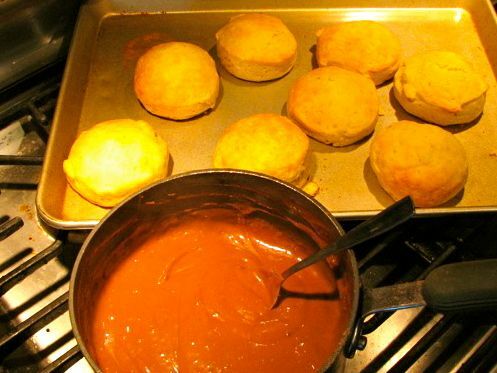 The best biscuits to serve with this gravy are Grands Homestyle. Totally healthy, totally fat free. Runner’s food at it’s best. Ha! Ryan describes as warm chocolate pudding. My kids LOVE it, of course. Anytime you can get away with having chocolate for breakfast, it’s a good thing. Let me know if you give this a try and what you think! Thanks Ashley. 2 Tablespoons of butter. 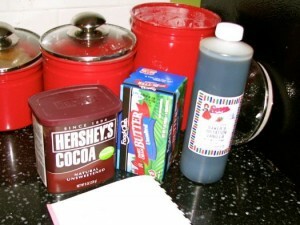 We usually add a bit more cocoa too to make it extra chocolaty. I still remember when Staci made it for me for the first time.. I thought I was in heaven!! Best gravy in the world!! She showed me your Memaw’s little cookbook but I never got the recipe. Thanks for sharing!! I am going to make some this week, I can’t wait!!! Ryan I have tried to contact you for years. If you remember me, email me.